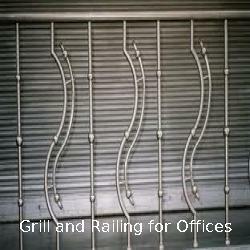 Pioneers in the industry, we offer grill and railing for offices from India. We are providing stainless steel railings which can be used in offices. These non-corrosive grills have excellent physical properties and are widely appreciated for its strong and safe performance. We offer premium quality stainless steel products at the most comprehensive range of price. Looking for “Grill and Railing for Offices”?